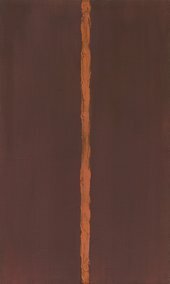 The title of Barnett Newman’s painting Adam 1951, 1952 (Tate T01091; fig.1) aligns it with a cluster of other pictures by the artist that reference the biblical account of humankind’s beginnings: Eve 1950 (Tate T03081; fig.2), Genesis: The Break 1946 (private collection), The Beginning 1946 (Art Institute of Chicago, Chicago) and Genetic Moment 1947 (Fondation Beyeler, Riehen and Basel). Moreover, in Newman’s writings, ‘the first man’ and his experience of the world, envisioned biblically and anthropologically, are key themes. As such, one way to approach interpretation of Adam is to explore the significance of beginnings – old ones and new – for Newman and for some of his abstract expressionist colleagues. Looking back in 1967 on the occasion of a symposium in honour of Jackson Pollock’s first major museum retrospective, held at the Museum of Modern Art, New York, Newman recalled that in 1940 he and other artists felt the need to ‘start from scratch’. ‘In 1940, some of us woke up to find ourselves without hope – to find that painting did not really exist … or … was dead. The awakening had the exaltation of a revolution. It was that awakening that inspired the aspiration … to start from scratch, to paint as if painting never existed before.’1 The reasons for feeling this way in 1940 did not need to be spelled out then, nor do they now. The cataclysms and traumas of recent history were intensely present. In 1939, as a new world war was beginning, artist and critic Nicholas Calas had wondered ‘how will painting continue and at the same time express the tragedy of our days?’2 For Newman and some of his contemporaries, moving forwards in a time of trauma demanded a move backwards. Starting anew required returning to primal scenes of art and even of all creation in order to recover and work through formative episodes. This psychoanalytic model of temporality permeated their thinking about artistic recovery. For Newman, starting from scratch was not a matter of making a break in a linear timeline of art and beginning with a tabula rasa. It meant rather turning that timeline back on itself, circling back to beginnings, originary moments, in the history of art and of creation. His words ‘as if painting never existed’ did not mean ‘as if art had never existed’. Before ‘painting’, for Newman, stood a whole string of artistic beginnings, represented by so-called ‘primitive’ and ‘archaic’ arts – pre-Columbian stone sculpture, Oceanic masks, Native American burial mounds, Northwest Coast Indian art – some of them painted, some quite abstract, all of which he studied, wrote about and admired. He seems not to have wanted or needed to imagine making art as if these precursors had never existed. His identification with them was too strong. Construing such works as ‘beginnings’ calls attention to teleological and ideological aspects of that term. Any beginning appears as such because of some ending towards which it is understood to be a first step. The allegedly ‘primitive’ artefacts Newman admired represented advanced stages in artistic traditions that had begun long before. Newman was merely returning to earlier stages in art’s history, not the actual beginnings he took them to be. He was starting not ‘from scratch’ but from far along the line. Like several of his colleagues in the New York School of avant-garde artists, Newman identified with the figure he imagined to be responsible for such artefacts: ‘primitive man’, even the very first human, yelling in ‘awe and anger at his tragic state, at his own self-awareness and at his own helplessness before the void’.3 There was no question that he saw himself reliving the primal experience he envisioned. ‘What was the first man, was he a hunter, a toolmaker, a farmer, a worker, a priest, or a politician? Undoubtedly, the first man was an artist.’ Newman’s point was that ‘the aesthetic act always precedes the social one’.4 For him and the New York School, modern man was like primitive man in feeling terror in the face of overwhelming, uncontrollable forces, and the necessity for effective artistic expressions of distinctly modern terror and tragedy superceded all other pursuits. This first man, as Newman envisioned him, was both a primeval worshipper of a totemic ‘tiger-ancestor’ and the biblical Adam. Newman believed that the author of the book of Genesis had portrayed Adam allegorically as an artist: his eating fruit from the tree of knowledge was the mark of his desire to seek ‘the creative life to be, like God, “a creator of worlds”’.5 Newman identified with both Adam and God in the brotherhood of creators of worlds. Newman’s words often deliberately mixed biblical history with imaginative anthropology, and this combination points to something important about Newman’s habits of thought: his interest was in beginnings of every kind rather than in any consistent history. Contradictions between archaeology, anthropology and religion were unimportant; all earlier moments construed as creative beginnings in whatever field of study could be merged. No matter that the first man who emerged from such incompatible accounts had both the hubris to emulate God and the anxiety to quiver before the cosmos and the fates. The conflict enabled Newman to envision Adam in his own image. In this sense, his painting Adam is a self-portrait, with conflict at its core. Within the endless panorama of beginnings that his work represented, Newman spotlighted certain moments as especially radical beginnings. One came in 1944–5, when, by his own assessment, his artistic maturity began. All the art he had made prior to that year he destroyed.9 That is, he destroyed his own artistic beginnings in order to claim later stages of his work as starting points. Beginnings were Newman’s speciality, so it is no surprise that he was attentive to representing his own artistic beginnings. In 1958 and 1959, when he was invited by E.C. Goossen and Clement Greenberg to hold solo exhibitions of his work (his second and third solos, the first having been held back in 1951), Newman chose to include only paintings made between 1946 and 1952, as the title of one of the shows indicated.11 This was noted in nearly every review of the exhibition.12 If we did not understand Newman’s obsession with beginnings, we might take this highlighting of earlier works as marking a lack of confidence in his paintings of the intervening six or seven years. To some extent he really had lost momentum; his productivity had declined dramatically since 1955. But we should also see this decision as fulfilling a desire to return to an earlier stage of his art that he wished to frame as his beginning. As Newman said at that time in response to his critics: ‘They say I have advanced abstract painting to its extreme, when it is obvious to me that I have made only a new beginning.’13 Evidently, he prized beginning over advancement, even when the latter term was not intended as a criticism. The process of getting the masking tape’s edges positioned where he wanted them and keeping them straight must have taken some time and effort, especially with larger paintings. Newman sometimes did not seal the edge of the tape but left it floating slightly, which permitted some paint to seep underneath. Seeping paint leaves a visible record of the layers of labour: first blocking out the central line with a strip of tape, and subsequently protecting the edges between the line and the larger field of colour with strips of tape on either side while the line is filled in. Time invested in preparation of the taped canvas enabled faster application of paint. A clean, straight edge could be achieved relatively quickly once the tape was in place. Actual painting time was compressed by virtue of extended – and concealed – preparation time, and in cases where the band was repainted several times, there were multiple preparations that might or might not be visible. Adam has distinct ridges marking parts of its bands – especially the narrow one in the right of the composition (fig.4). Inside that band, the texture of the canvas ground is more evident, indicating fewer layers of paint (and an earlier application of tape). The raised ridge that separates this band from the adjacent deeper reddish-brown field suggests multiple phases of work with tape on both sides of the ridges. 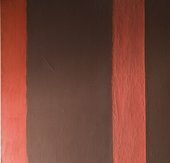 In what appears to have been the final phase of work, dark reddish-brown paint from the wider field of colour was allowed to cover the ridge and seep slightly onto the brighter red of the band. Parts of the wider bands at the left also display ridges, and here both of the reds spread over the ridges at different points (fig.5). The separation of the wider bands from the expanse of deep reddish-brown is more laboured and less sharply defined. Band and field converge in this point: the visible effort, the actual painting, represents a small fraction of the time involved in producing the work. The look of quick execution is bought at the price of an extended labour that is only partially apparent. The use of masking tape also introduces other complications into the production time. Normally the sequence of actions that have produced a painting can be roughly reconstructed from the layers of paint that constitute the surface like geological strata. Masking tape, when painted over and then removed, exposes an underlying layer by extracting a slice from the topmost layer. In addition to disrupting the temporal sequence of production, and exposing it to view, this process allows the artist to return to an earlier stage of the painting and, on that part of the canvas, begin again. Although it is a relatively subtle visual presence, the tape is an important sign of the possibility of returning to an earlier stage in the painting process. The most autographic, expressive element in Onement I is painted on top of the tape, which puts its survival into question. Its future once hung in a delicate balance, as the artist weighed a choice. Which was greater: the urge to begin again, to give oneself a second chance, to return to an earlier stage in the painting process and invent a new, partial beginning; or the desire to preserve the fresh and dynamic latest addition to the picture, which was also its most expressive and spontaneous component? Contingency and fragility were powerfully encoded in this combination of formal elements. The choice Newman made – to leave the tape in place – effectively transferred the choice to viewers, not as a real possibility, of course, but as a hypothetical one. By making one of its layers imaginably removable, thereby investing a decisive and forceful composition with uncertainty, Onement I enfolded questions of contingency and time. The opportunity to circle back to an earlier stage of painting may not have been taken by the painter in this case, but he wanted the option, and the evidence of this desire remains visible. The temporal sequence involved in producing the easily distinguished layers of Onement I is vividly clear, but its contingency is forcefully affirmed. In Adam Newman made the decision to pull the tape. By this time, in 1951–2, thanks to the example of Onement I and Concord, the possibility of leaving the tape in place as a compositional element was present from the moment of its application. The status of the tape in Newman’s work had changed – from invisible, instrumental tool on a par with a paintbrush to possible collage material. Leaving the tape on would have to be done rarely, however, if it were to convey effectively the sense that a special occurrence had warranted a departure from ordinary procedures. We can see that the time of production is convoluted in Newman’s paintings. Things that appear quickly done are often labour- and time-intensive. Things that are actually quickly done are enabled by long preparation. The signalling of production time through paint layering is made a matter of complex reflection, involving circlings back, fragile contingencies and surface rifts fully or partially repaired. Newman’s own comments on the duration of his process highlight its paradoxical temporality. ‘I was asked by a viewer how long it took me to paint Vir Heroicus Sublimis [1950, 1951 (Museum of Modern Art, New York)]. I explained that it took a second but the second took a lifetime.’24 By expanding preparation time to encompass all of his life experiences he raised the temporal compression to its maximum. What about the temporality of viewing Newman’s paintings? Their relatively simple, abstract structures present viewers with a totality that can be perceived and described almost immediately. Newman himself described this effect of his work: ‘At one instant one gets the whole painting … there is nothing to really examine.’25 But at the same time, Newman encouraged viewers to stand close to his paintings, not necessarily to examine the surfaces but to immerse themselves in the spaces of his often expansive colour fields. A famous photograph from 1958 shows Newman himself standing close to his painting Cathedra 1951 (Stedelijk Museum, Amsterdam), exhibiting the proper mode of address towards his works (fig.6). But standing close to the painting as Newman prescribed would also bring awareness of the subtleties of layering, edges and complex fields that I have been describing. Newman certainly wanted such subtleties to be noticed, or he would not have left evidence of the process, including bleeding, which sometimes exposes multiple layers of underlying colour. In light of these clues, a different sense of time overtakes the presentness of the experience, as the viewer unfolds the complex time of the painting. A viewer who chooses to emulate Newman’s own example of contemplation before Onement I (even if not for a full eight months), by following Newman’s protocols and standing close to the surface, would likely be provoked to circle back to earlier stages of the painting construed as beginnings. With Adam, when a viewer steps back to take account of the full effect of the composition, an unusual irregularity becomes apparent. Most often, Newman’s painted bands follow straight lines. In Adam, however, the band near the centre widens slightly in its bottom half, diverging from the vertical by 4 or 5 degrees to the left. This bent band may be unusual in Newman’s work, but the conflict it introduces into the painting – between regularity and irregularity, structure and disruption, or order and disorder – is not. The bold assertiveness of the two wide, bright red bands, in proximity to one another, is undermined by the drift of one towards the other. The deviation causes the painting’s hard geometry to tremble. Newman’s paintings employ various devices to produce conflicts of this sort, and this aspect of his work is something he shares with his colleagues of the New York School.31 For many of these artists, conflict inside and outside the individual – between conscious control and spontaneous impulse, or between forceful action and expressions of impotence before the power of fate and history – characterised their experience of modern life and their sense of self in the period after the Second World War. Unsurprisingly, it also permeates their painting and their thinking and writing about art. The conflicts and paradoxes that have emerged in the present discussion of Newman’s attitudes towards beginnings and time belong to this thematic framework. His paintings have a conflicted relationship to history. As noted earlier, Newman’s appetite for beginnings of every sort overshadowed any interest he had in a consistent history. Undoubtedly his attraction to beginnings had an historical motivation. Newman’s writings explicitly linked desperation, hopelessness and the irresistible impulse to ‘express’ terror and tragedy to experiences of historical trauma. But Newman’s project is also fiercely anti-historical. It seeks escape from history by returning to imaginary prehistoric, presocial moments, when artists emulated the divine creator, of whom they had direct knowledge, and when the sole concern of their aesthetic creation was expression of the timeless, terrifying and tragic human condition. Perpetual philosophical problems, emanating from a universal human condition, are the frame of reference for his art and thought, and this deprives history of any significant change. Historical time is structured by constant repetition and eternal returns. The changing complex of political, social and economic relations that constitutes human history drops out of consideration. Whether this material history is envisioned as linear or cyclical or something else, Newman and his art seem to stand outside of it. One can hear Newman’s own voice echoing in that notion of timeless time – a time whose circles, loops and discontinuities are as tangled as his paintings are rectilinear. It is also a time that renders history an endless and unvarying sequence of new beginnings. 1. Barnett Newman in ‘Jackson Pollock: An Artists’ Symposium, Part 1’, Art News, April 1967, p.29. 2. Nicholas Calas, ‘Painting in Paris is Poetry’, Poetry World, July–August 1939, pp.43–4. 3. Barnett Newman, ‘The First Man Was an Artist’, Tiger’s Eye, October 1947, p.59. 6. Barnett Newman, ‘Surrealism and the War’ , in John O’Neill (ed. ), Barnett Newman: Selected Writings and Interviews, Berkeley 1992, p.96; cited in Richard Shiff, Doubt, New York 2008, p.171. 7. Barnett Newman, ‘“Frontiers of Space”: Interview with Dorothy Gees Seckler’, Art in America, Summer 1962, pp.83–7; reproduced in O’Neill 1992, p.250. 8. For example, Hilton Kramer stated that ‘The fact that a painter could go on doing these paintings year after year speaks for a meager level of feeling; they are sustained by a fixed idea rather than any new sense of experience.’ Hilton Kramer, ‘Month in Review’, Arts Magazine, April 1959, p.45. 9. ‘I first created my concept and developed my present style in 1944–5’. Barnett Newman, letter to Clement Greenberg, 9 August 1955, in O’Neill 1992, p.204. The earliest surviving works by Newman are drawings from 1944 and paintings from 1945. 10. Barnett Newman, ‘Interview with Emile de Antonio’ , in O’Neill 1992, p.305. The full story is told in Thomas B. Hess, Barnett Newman, exhibition catalogue, Museum of Modern Art, New York 1971, p.51 onwards. 11. The exhibitions were held at Bennington College in Vermont and at French and Company in New York. 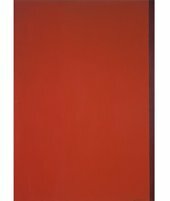 The latter was titled Barnett Newman: A Selection 1946–1952. 12. Ann Temkin, ‘Barnett Newman on Exhibition’, in Barnett Newman, Philadelphia Museum of Art, Philadelphia 2002, p.51. 13. Barnett Newman, statement for the catalogue of The New American Painting, exhibition catalogue, Tate Gallery, London 1959; reproduced in O’Neill 1992, p.180. 14. The issue of time in Newman’s painting has been discussed by several critics and historians. See, for example, essays by Carol C. Mancusi-Ungaro and Richard Shiff in Shiff, Mancusi-Ungaro and Heidi Colsman-Freyberger, Barnett Newman: A Catalogue Raisonné, New Haven 2004. 15. Newman in a draft statement on the Ohio mounds titled ‘Prologue for a New Aesthetic’, 1949; reproduced in O’Neill 1992, p.175. 16. 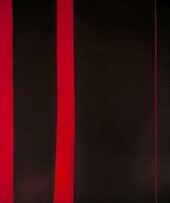 Carol C. Mancusi-Ungaro, ‘The Paintings of Barnett Newman: “Involved Intuition on the Highest Level”’, in Shiff, Mancusi-Ungaro and Colsman-Freyberger 2004, p.119. 17. Barnett Newman in a 1966 interview, quoted in ibid., p.132. 18. Newman 1959, in O’Neill 1992, p.180. 22. See also Concord 1949 (Metropolitan Museum of Art, New York). 23. On masking tape in Newman’s work, see Temkin 2002, pp.49–50. 24. Newman 1962, in O’Neill 1992, p.250. 25. Newman 1966, quoted in Mancusi-Ungaro 2004, p.133. 26. This quotation comes from Newman’s draft statement on the Ohio mounds, 1949; quoted in Richard Shiff, ‘Newman’s Time’, in Melissa Ho (ed. ), Reconsidering Barnett Newman, New Haven 2005, p.164. 30. Jean-François Lyotard, The Inhuman: Reflections on Time, trans. by Geoffrey Bennington and Rachel Bowlby, Stanford 1991, p.82. Emphasis in the original. 31. I have developed this argument at length in ‘Barnett Newman’s Solo Tango’, Critical Inquiry, Spring 1995, pp.556–80; and in my book Reframing Abstract Expressionism: Subjectivity and Painting in the 1940s, New Haven 1993. 32. Entry for Adam in Temkin 2002, p.192. 33. Metro: International Directory of Contemporary Art, Milan 1964, p.261. 34. Barbara Reise, ‘The Stance of Barnett Newman’, Studio International, February 1970, p.54. Michael Leja, ‘Adam and Newman’s Beginnings’, in Michael Schreyach (ed. ), In Focus: Adam 1951, 1952 by Barnett Newman, Tate Research Publication, 2018, https://www.tate.org.uk/research/publications/in-focus/adam/newmans-beginnings, accessed 20 April 2019.